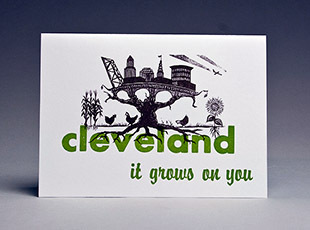 The CLE Colectiv is dedicated to celebrating the good, the quirky, and the authentic in Cleveland with a line of hand-made letterpress cards. The text is hand set with vintage metal and wood type and then printed on a Vandercook proofing press from the 1950s. Every card is lovingly folded by hand, paired with an envelope, and packaged for your writing pleasure. Our cards are printed on reclaimed paper that would have ended up in a landfill, but instead became a fabulous card!